The lovely lemon myrtle tree (Backhousia citriodora) is a native to Australia and the leaves are used for food flavourings, as a tea, and are processed as an essential oil for our pleasure. If you’ve never smelt this powerful oil just imagine a crisp lemon scent with a deep twist of the Australian bush – a magical blend of lemon and other Aussie leaves like eucalyptus and tea tree. It belongs to the Myrtaceae family, and the genus Backhousia. This is not to be confused with Myrtle which is also a part of the Myrtaceae family but has the genus Myrtus which is native to Europe. If you read about myrtle, it is likely to refer to this Myrtus communis. So isn’t it interesting that lemon only contains about 5% and this amazing lemon myrtle contains almost 100% citral! Wowsa! In addition to the lemon scent, citral has been reported to have extremely high anti-microbial qualities and compared to tea tree seems to be much higher. The oil today is used just for this purpose and is particularly noted for it’s tested use on MCV which is a skin virus. Lemon myrtle essential oil is also used on cold sores, which are also a virus (herpes) so it stands to reason that this oil is very potent. You could also use lemon myrtle oil as an inhalation for colds and flu and as a treatment for anxiety and depression (as many other lemon scented oils can be used for similar issues). It’s also great for cleaning because of it’s strong anti-bacterial action. The lemon myrtle leaves have a history with the indigenous people of Australia, as the plant has been used as a flavouring and a medicine for many, many years. 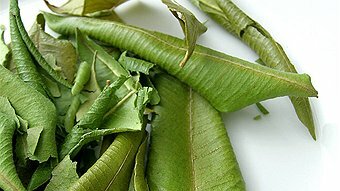 Today the leaves are also just dried and crushed to be used in foods and as a tea, and represent a particular group of foods and flavours only found in Australia. I use this oil sparingly in my practice and it seems to jump out when someone is plagued by stress and really needs to detoxify their emotions. It works well in a perfume but you need to be careful about using too much in a body oil blend as it can be sensitising. In a little dish mix these oils and anoint your pulse points or chakras – 3 drops of essential oils and dilute with a few drops of carrier oil – always patch test first! Happy blending and remember to use your intention when you are creating your formulas. See my article about intention. This entry was posted in Essential Oil Profiles, Essential oil recipes, Essential OIls and tagged aromatherapy, cedarwood virginian essential oil, cleanse negative energy, consciousness, daily ritual, energetic space cleansing, essential oil recipes, essential oils, essential oils for cleaning, essential oils for coughs and colds, essential oils for happiness, health, juniper essential oil, lemon essential oil, lemon myrtle essential oil, lemon scented tea tree essential oil, lemongrass essential oil, lime essential oil, may chang essential oil, melissa essential oil, natural scents, orange essential oil, patchouli essential oil, petitgrain essential oil, rosewood essential oil, scent, scent your space, space cleansing with essential oils by suzannerbanks. Bookmark the permalink. I’m getting really inspired now! I absolutely love lemon verbena and I love the idea of the blend with the Patchouli and the Rosewood, Note to self…Must get some more oils! I really like the idea of this blend! Thanks. Thanks Susan this oil is so Australian and you can’t mistake it when you open the bottle and have a whiff. It’s lemon with a bush twist. Powerful! PS, was the first post I read, now onto sandalwood! Divine!